Using whiskey barrels to age your own whiskey or in your wine making process is a fun and practical way to introduce new flavor profiles to your whiskey and wine. Unfortunately, wine and whiskey barrels only retain their flavor enhancing characteristics for a few batches and then the robustness of the effect decreases markedly. Fortunately, there are some fun projects you can take on at home to turn those once-flavorful barrels into great home and garden projects. Here are a few to get your imagination started. This might be the trickiest part as the hoops that hold the barrel together are made of metal so simply taking a saw to it won’t work. If you don’t have a full workshop available it might be time to find a lumberyard that can do this for you. It’s up to you whether you need this step or not. If your barrel isn’t that old and worn looking, or, if you like the old, worn appearance then you may not need to do this part. If, however, you want a rustic look but also want it to feel ‘new’ then this won’t take very long. Carefully remove the middle hoops of the barrel – they may be held in place by tacks so simply remove them and the hoops should come free. Alternately you can use painters tape to block off the hoops so they won’t get marred by stain. Sand the entire surface of the wood – it’s up to you how smooth and fresh you want it to look but, as this is supposed to be a rustic piece, try to retain the character and not sand too much. Stain the wood using a simple wood stain – something dark (like dark walnut) will look best. Create an apron to hold the table top first by using 1×4 lumber to make a frame that will site on the barrel rim. Carefully measure the length and width of the barrel, cut the lumber to the correct size, and construct the apron. Build the table top using the same 1×4 lumber remembering to make the top a little longer and wider than the apron you already created. Sand and stain the apron and the table top to match the barrel. Attache the top to the apron using decorative hinges so that the inner parts of the barrel will be accessible. Use two 2×12 boards as the base for your whiskey barrel coffee table. Carefully measure the cut-out you will need to hold the barrel and use a jigsaw to cut out the shape in each board. Sand and stain as you did the other pieces of the table. One complete, place the barrel in the base; your whiskey barrel coffee table is complete! 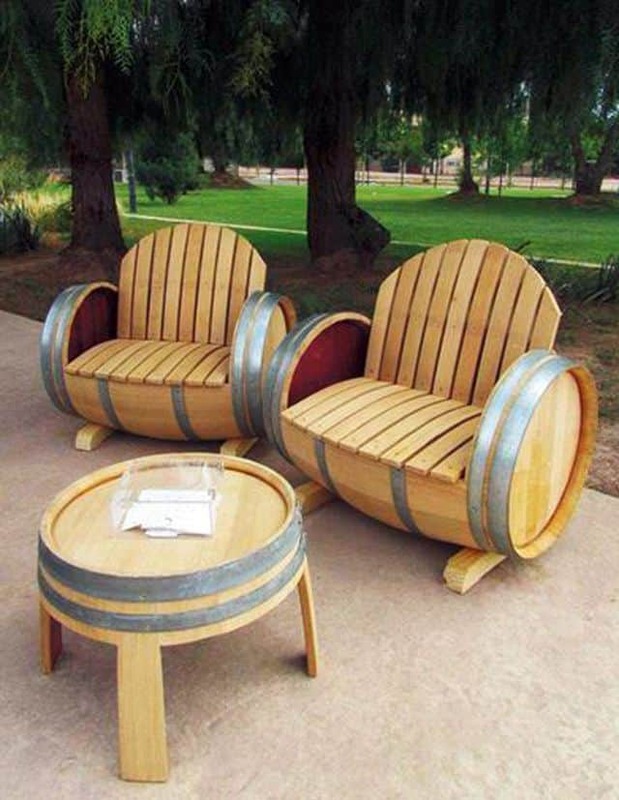 Whiskey barrels and wine barrels can be used in a variety of ways to make wine barrel chairs. If the barrel is kept intact, you can simply remove the head, make a cut-away to create the seat back, build a platform to act as a seat, and decorate it with a nice, comfy cushion. The possibilities multiply though, when you take the whole barrel apart and use the staves to create wine barrel chairs of various configurations. The perfect pairing with your whiskey barrel coffee table! 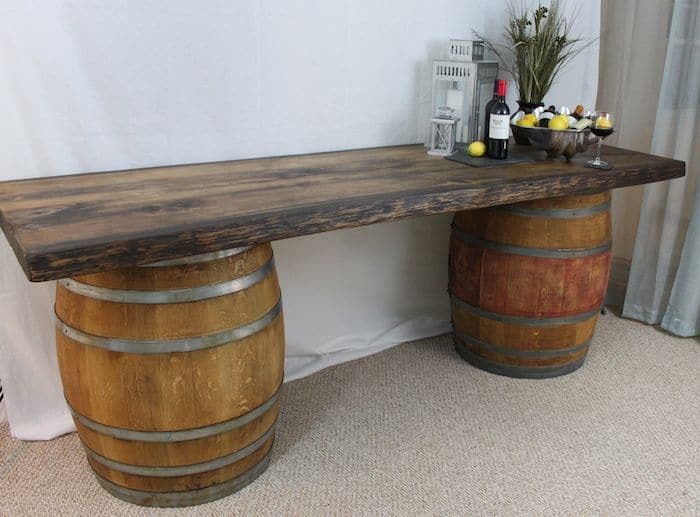 Creating a wine barrel bar is probably one of the easiest barrel projects for do-it-yourselfers. Step 1: The key to this project is finding two barrels that are the same height. Amazon.com has some great barrel options with the added bonus that they ship almost anywhere! Step 2: This step completely depends on what you want the wine barrel bar to look like. 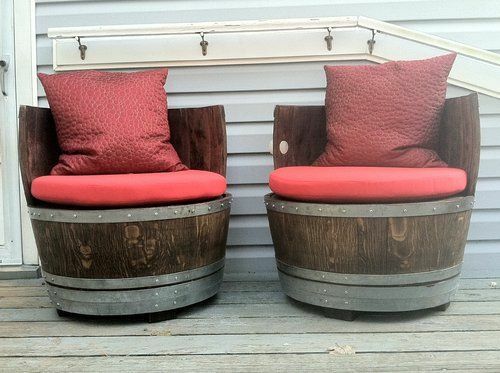 If you’re interested in a more rustic appearance, then leave the barrels in their natural state. If you’re hoping for a more refined look, then sand the barrels down, stain them using a darker colored stain, and apply a polyurethane finish for a slight shine. Step 3: Find a piece of 2×12 lumber cut to the length that you wish the bar to span. Treat this piece of lumber in the same way you did the barrels so that they will match. Step 4: Place the barrels in the room you want to feature the bar and attach the top to each of the barrels by screwing them together. Alternately you can simply place the top on the barrels to make for a more portable wine barrel bar. Another super easy project is to create a half barrel planter to use in your garden. It’s as simple as cutting a barrel in half, drilling drainage holes in the bottom, filling it with soil, and planting your favorite plants. For variety, try not cutting the barrel exactly in half but at the ⅔ point instead – this will create two planters of differing heights adding even more interest. To avoid using too much soil you can fill the bottom of the barrels with large rocks to take up space, or build a small platform to raise the level of the soil. You can use half barrel planters for small shrubs, flowers, or as an attractive herb or ‘kitchen garden’. You can find barrels for these projects, or to age your own whiskey, here.